Petite owl earrings in brown or blue. Black crystal covered bow earrings. Measures approximately 3/4" long and 1/2" high. Large but lightweight wooden earrings with tortoise shell pattern. Measures 2.75" diameter. 3/4" round disk covered in rhinestones and set off with 3 teardrops. Hangs approximately 2.5". Beautiful! Leather like bracelet covered in purple flowers, each with a rhinestone center. 8" long and 2.75" wide. On trend style without breaking the bank. 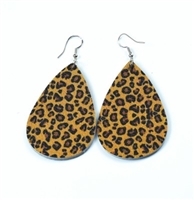 These faux leather tear drop earrings measure 1.5" wide x 2.25" long. Pattern is printed on both sides. Burnished Silvertone Christian Fish & Turquoise Cross Ring. Stretch to fit. One size fits most. Mighty things arise from a little acorn. Remember your strength with this necklace. Approximately 27" long. Trendy tassel necklace features faceted beads finished with a single pave bead and chain-link tassels. Acrylic beads and zinc metal alloy. Nickel and lead free. Hangs 24'' long with 6'' extender.